The calendar says October but you think it feels more like late November or December where you let the belt buckle out a notch, stay off the scale and enjoy that holiday reveling. But alas we have yet to don our Halloween costumes—much to the chagrin of retailers who are already pushing holiday product—and we have yet to accomplish fall race goals. Whether you’re training for the next event or simply using the fall and winter to refresh for next season, consider these five ways to stay in shape and motivated without feeling like you’re training full-throttle. 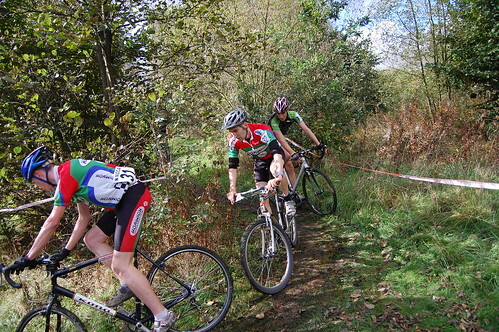 Test yourself at cyclocross. Combine road biking with steeplechase and you’ve got yourself a way to brush up on your bike skills, play around in the mud, and burn mass quantities of calories pumping pedals, hefting your bike over and through obstacles and rushing to the finish line. Plus it’s a sport that’s up and coming in Chicago seeing mass growth in the past few years that there are just as many newbies taking to the course as there are regulars so the pressure’s off. Take up indoor riding. Carrying on a conversation pedaling along the Lakefront Path or along a busy street isn’t exactly the easiest thing. Nor is it much fun to have to bundle up when the mercury drops and return home from a ride chilled to the bone. But if you hook your bike up to a trainer at one of our indoor clinics and join a few other hearty souls, the conversations make the minutes fly by, and being protected from the elements makes the rides more enjoyable and consistent. Take a break from the routine to cross train. You’ve gone swimming, biking and running—or maybe just running—all summer. But have you ever considered adding a new element to the mix? Try swapping out a running day for a pool workout or hit the bike. Channel your core. Going with the cross-training theme, consider harnessing your energy, breath and movement through yoga. Add a yoga day to the routine to stretch out any tight muscles and improve flexibility in an attempt to ward off injury. While you’re sweating and balancing on your limbs, your body will be working to strengthen, even tone, tiny muscle fibers. Strengthen with stairclimbs. Fall and winter in Chicago mean a circuit of stairclimbing events around the city’s and suburb’s tallest buildings. Your heart rate might sky rocket as you sprint up the stairs—94 flights if you register on Nov. 2 for the Hustle Up the Hancock in Feb. 2010, 103 flights if you sign up for the SkyRise Chicago on Nov. 15, or 80 flights if you choose the Step Up for Kids in Jan. 2010—but those lung-busting minutes will only help come spring. Plus the views from the top are priceless! Another stairclimbing event is Omaha's Trek up the Tower. Measuring in at 40 floors, 870 steps, and 633 feet into the sky, the First National Bank Tower is the tallest building between Chicago and Denver. Sorry to just be seeing this message now :( but thanks for the tidbit on the Trek up the Tower. I bet I saw that building the last time I drove through Omaha. That's a lot of steps!